One of the most important topics studied in vet school is anatomy — as veterinarians, we need to know what is normal and what isn’t. Maybe you’ve experienced this scenario before — your happy, fun-loving pet is playing and when she rolls on her back, you suddenly notice a firm, diamond-shaped lump on the roof of her mouth, just behind her front teeth. Panic bells start ringing. But not so fast! This is actually a completely normal structure. It’s called the incisive papilla and every dog has one, though some may be more prominent than others. The incisive papilla contributes to the dog’s intricate and exceptional sense of smell. A human’s primary sense is vision — we understand our environment best through visual pictures. Dogs, on the other hand, rely most heavily on their sense of smell. To put into perspective just how sensitive a dog’s sense of smell is, dogs have more than 200 million olfactory receptors. Humans only have about 5 million! And it gets even more interesting. Dogs don’t just smell with their nose. They also have a vomeronasal organ, which helps detect chemical cues called pheromones. Pheromones are important for communication and passing social messages between dogs. 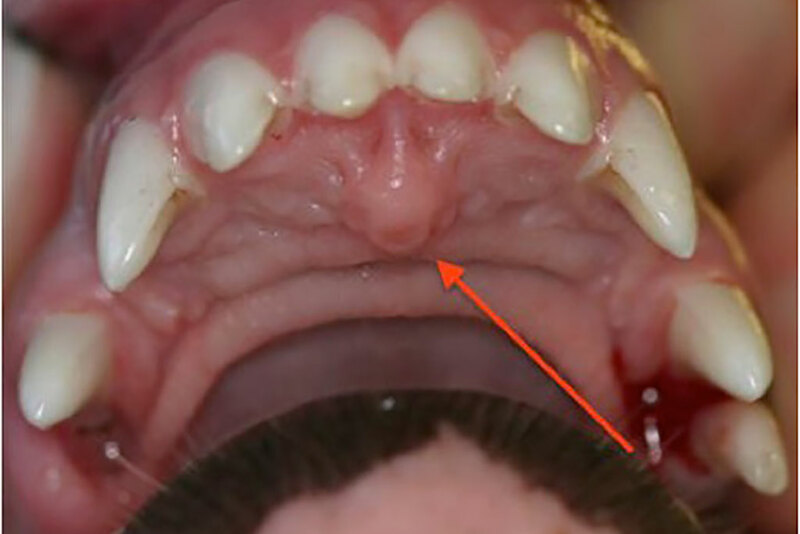 The incisive papilla helps collect these cues and is connected to the vomeronasal organ.